Since 2013, FlightSimCon has been a staple in the calendar for many flight simmers across the globe. Over the years, it has grown in popularity. More and more developers have found their way to the event showcasing their new products, more enthusiasts have taken the trip to connect with the community and many, many newcomers to the hobby now take part in the learning experience. 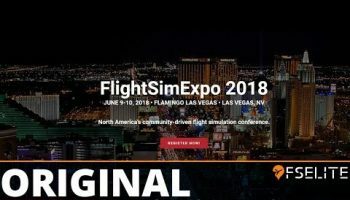 FlightSimCon has certainly become one of the biggest events of the year and certainly the largest event in North America. As you can imagine, for anyone attending these events, it’s certainly not a cheap weekend. Hotels, flights, food, drinks and more mean that the expenses quickly add up. Furthermore, there’s a lot of time that goes into events by people and groups. For example, we had to ensure that equipment, material and people are all in the right place at the right time. It’s a complex affair, but one that yields massive results for everyone involved. From my personal perspective, I felt that FlightSimCon 2017 was a huge success and an enjoyable event. For sure, there was room for improvement, but my anticipation for FlightSimCon 2018 was exceptionally high. During the months after the event in June, multiple developers, media partners and event-goers began receiving emails from a group called FlightSimExpo. At the time, my initial thought was that FlightSimCon was simply rebranding itself due to the popularity of the event. At the time, no information was received regarding locations, dates or possible exhibitors. I found myself very confused – as did many others in the community. At this time, an email from Nicole was received stating that the team involved with FlightSimCon’s planning was no longer involved in the event. 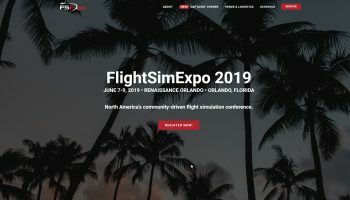 When I began receiving emails from names I associated with FlightSimCon using a different branded email address, FlightSimExpo, it was clear that there were indeed two separate events. As the weeks went on, it became clear that these were two competing events to be held in very different parts of the country, but in very similar time frames. 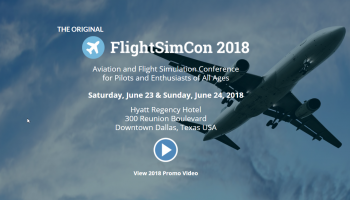 Soon, FlightSimCon (Glander Associates Events) announced that the next FlightSimCon would be held in Dallas, Texas on June 23rd and June 24th, 2018. At the time, I was privy to information from FlightSimExpo suggesting the event would be held in Las Vegas towards the beginning of the same month. As I’ve suggested above, going to one of these events isn’t a simple fact of turning up and enjoying it, there’s a lot of expense and time involved. Whether you’re a media partner, an exhibitor or someone who just wants to visit their favourite developer to say thank you, it’s a journey that – whilst difficult – is worth it. However, the thought of making the trip twice in such a short time frame adds more complexity, and ultimately, segregation. A couple of weeks back, Chuck (the co-founder of FlightSimCon) emailed us with information surrounding the reasons why there are two Flight Sim shows in North America in 2018. Furthermore, he suggested that we (FSElite) investigate the information ourselves to form an unbiased and fact-driven article to answer this very question. Obviously, as per our Community Charter, we took on the task and have spent the time since fact-finding, speaking to developers, and digging out old communications to piece together a timeline and key information. Disclosure: We have, and continue to be, committed to attending FlightSimExpo in Las Vegas in 2018. Whilst this commitment may be perceived as we have preference to a particular show, we have expressed interest in attending FlightSimCon 2018 also. The reason why I personally cannot attend is quite simply I have important personal commitments on the dates of FlightSimCon 2018. What is important to consider before you read on, is that a lot of the information I have gathered are statements from people involved. I have spoken to a range of people, all with varying levels of involvement, to help paint the picture as clearly as possible. Of course, some things can be left open to interpretation, so keep this in mind while reading on. Furthermore, we have also been provided evidence to support some of these statements. We won’t be publishing these email statements publicly, as this should be kept private and confidential. We hope that you trust us when we say we’ve seen evidence or have had conversations with the right people. Did members of the FlightSimExpo team use assets, information and contacts from FlightSimCon (Glander Associates Events) to support their efforts in building a contact list for FlightSimExpo? Was there intent to hide or retain information from Nicole or Chuck (Glander Associates Events) by the FlightSimExpo team to benefit future events? Did it seem likely that developers had conspired against Glander Associates Events to better suit their interests and needs? Was there intent for FlightSimCon to move from the Hartford area in the future? Was there ever any discussions about keeping the occasion as a single event to benefit the community? Was the reason for the FlightSimExpo team splitting away from Glander Associates Events purely done for personal financial benefit? My primary purpose of this article is to dig into the reasons behind these questions. I will summarise each point with a personal belief, but I actively encourage you, the community, to draw your own conclusions based on our findings. For the purpose of this editorial, I spoke to the following people either through Skype or email. Email files have been kept on record whilst I have written notes from any Skype calls I have made. I feel the people above represent a good range of both sides, including neutral points of interest. Between the seven individuals above, I feel I have a clear picture. With this in mind, let’s take a deep-dive look into the story behind why there are two Flight Sim shows in North America in 2018. For the 2017 FlightSimCon event, both Evan and Phil were under a contract with Glander Associates Events. Whilst full details will remain confidential, it’s worth pointing out that both were on commission, which was of course dependant on the success of the event. According to Chuck, this contract ended at the end of the event (June 11th 2017). Another fact to mention here is that there were no non-compete clauses in any contract. Part of the contract was for them to both help secure and find potential exhibitors and sponsors to financially support the event. It should come as no surprise than that both would recognise and research those in the field to bring only the best developers to the show. This included names, company and contact details. All of this information was input into a Google Sheets document which all members had shared access to. It is the opinion of Glander Associates Events that the event organisers of FlightSimExpo used this information to get in touch with the same people to attend their event. Chuck from Glander Associates Events said that “the FlightSimExpo team had inappropriately solicited FlightSimCon’s contacts prior to their departure, and that due to their position at FlightSimCon, it would have been perceived as still representing the Glander Associates Event”. After speaking to the FlightSimExpo team, it would appear that upon termination of their contract, their access to Facebook, email addresses and shared Google Sheets documentation was revoked – meaning they could no longer access the information. This doesn’t demonstrate that the information could not have been used beforehand, but evidences the timescale. As of September 5th, 2017, the members from FlightSimCon who founded FlightSimExpo were no longer involved with Glander Associates Events. Myself – and others I have spoken to – were contacted via email after this date regarding FlightSimExpo. Further to this, I have seen evidence suggesting that the FlightSimExpo team found contact details on their own. D’Andre (AirDailyX) also reported to me that the FlightSimExpo team stated to him that they did not use previous contact information as he recognised this as Glander Associates Events’ property. This is further backed up in an email (dated 30th August 2017) the team sent to Chuck, which said “we would be willing to discuss the intellectual property belonging to Glander Associates Events Management Solutions”. This paragraph in the email included the aforementioned attendee list. It is my reasonable belief, and personal opinion, based on the evidence above, that the FlightSimExpo team did not use assets from FlightSimCon (Glander Associates Events) for the purpose of building a contact list for their own event. With the contact sheet in mind, there was also discussion on whether information was purposefully withheld from Glander Associates Events. Information such as contact details or discussion of future events. A lot of this concern came from the fact that during the event, a private developers panel took place on the Friday evening. FSElite wasn’t invited, nor attended, as it was intended to be an event for developers to have discussions amongst each other without fear of the information becoming public. As the event was originally planned and arranged by D’Andre, he was the ‘moderator’ of the event and as such, he was a good fit to talk to about the nature of the meeting. “It’s a place where developers can freely exchange information and ideas”, he said. “It’s surprising how little developers talk to each other so I wanted to have a place where they could all be heard without fear of things being leaked”. This was backed up further by Stefan Schaefer (PILOT’S), as well as another unnamed developer. This meeting went on for a few hours to come up with how developers can better work together and at no point was it used for the purpose of discussing the next FlightSimCon. D’Andre went on to tell me of how the meeting went, who was invited and why. “The meeting went very well, lots of discussions. It happened because developers need a place to talk to each other…I invited lots of different developers to attend. Nicole (Glander Associates Events / FlightSimCon) was fully aware of the event as she was putting together our room and tables etc”. This is further evidenced by an email sent by D’Andre sent to developers, which also included Nicole. The intentions of the meeting were clear and the future of FlightSimCon was never mentioned in this email. My assumption is that as this was solely for developers, the only purpose Nicole and other FlightSimCon event organisers would need to get involved was for logistical purposes – not attend the event. What was made apparent is the fact that towards the end of the meeting, a member of the group made a suggestion that the event next year should be held in Las Vegas. The impression I get from those who attended was that it was mentioned in passing in the closing minutes of the meeting. Others quickly joined in to say how effective that would be. Other than that, nothing was made official and the developers went their own ways. Part of the problem was that this entire meeting was supposed to stay confidential. With the prospect of Las Vegas, it was quickly leaked and the entire hotel was talking about it. Myself and Jordan (who were at the hotel that evening) heard about it pretty quickly and we also said between us that Vegas would be a great location for FlightSimCon 2018. A lesson to be learned here would be that things like this should be kept private and discussed with all the relevant stakeholders first. Both attendees and exhibitors were able to share their experience of the weekend shortly after the event had concluded. This information was shared among the FlightSimCon team at the time and was sent directly to them either via email or the Whoova app. On August 2nd, Orbx sent in their feedback from FlightSimCon 2017. 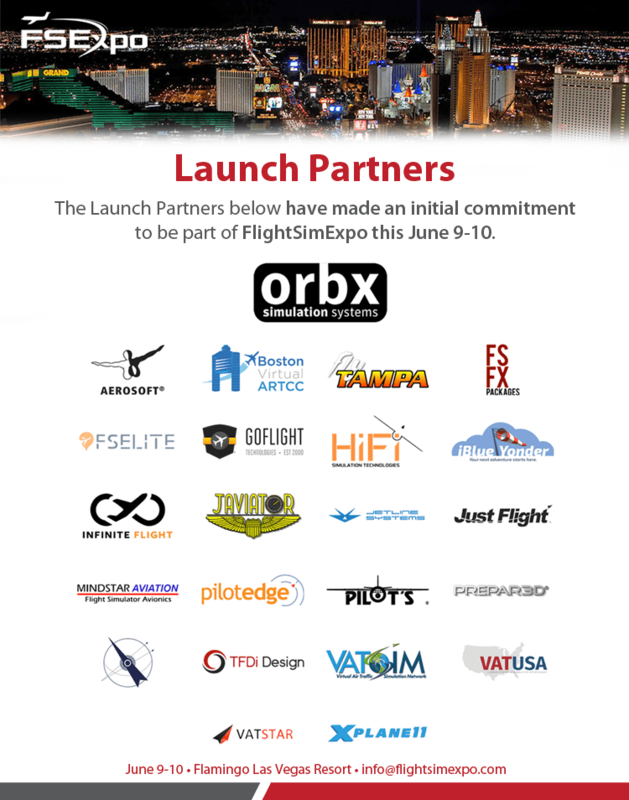 In this email, it was clear that Orbx was very keen for the event to take place in Vegas. Orbx provided a huge amount of support during the show in Hartford in 2017, and the team was keen to do the same for the next event. Whilst providing feedback in an email to the FlightSimCon team, the email said “As you heard from the private developer round table meeting, we all want to conduct FSC2018 in Las Vegas”. The feedback went onto say “Vegas has the most flexible options in terms of venues and locations, and most delegates will either come early or stay longer purely because its Vegas”. This same email also said that “Orbx will commit to be a headline sponsor once again – on the basis of the event being held in Vegas”. It also said that they would be “willing to increase the budget to help grow to this change of city / venue”. This email was provided to us by Chuck. When we contacted John (Orbx CEO) to discuss this, he said that he was shocked that “Chuck sent [FSElite] a copy of a confidential business email to support his case.” John did confirm he was happy for us to publish the quote above. It is my reasonable belief, and personal opinion, based on the evidence above, that there was no intent to hide or retain information from Glander Associates Events by the FlightSimExpo team. It is also my reasonable belief, and personal opinion, based on the evidence above, that there the developers panel was purely intended for the discussions on how to better the development community – not to discuss future events. The next important element is location. Las Vegas was mentioned at this developers meeting as a passing remark, however, it quickly turned into real discussion amongst event goers as a suitable place to host the next show. For many it was obvious – it covered the west coast, there’s plenty to see and do and there’s a lot more flight availability for many around the world. Granted, for those in Europe, it’s a few thousand miles further, which makes things a little more expensive. But for those on the west coast, it’s now easier than ever to get to. Like Chuck, I had my concerns about the location. FlightSimCon is a family friendly event, promoting people of all ages to attend and learn about aviation. Las Vegas is known for the more adult side of life: gambling, drinking, clubs and more. Not having been there myself, I can’t form an opinion on the suitability of the location, but my American friends tell me it’s just as child-friendly as any big city – it just happens to be a bit more ‘in-your-face’. Without knowing personally, from my perception of being at the event last year, I would also say that the average attendee age of FlightSimCon would be above 21. Stigma aside, I was excited to hear that FlightSimCon would travel around. By moving the location, it enables more people to come and spreads the reach of potential visitors. This brings me onto the next point of whether Glander Associates Events ever had intentions of moving it out of the Hartford area. It’s no secret Glander Associates Events is based in Hartford. For the past few years, having the event in their own town made sense. It was easy for them to get around, find a good venue and ensure that they could get where they needed to easily. Furthermore, since the first FlightSimCon, hosting it in Hartford became an established staple of the event – whether it was in the museum or in the hotel, knowing the space involved makes event planning much easier. I believe this is what raised concern for many of the exhibitors. For the past 4 years, it had been held at the same location. 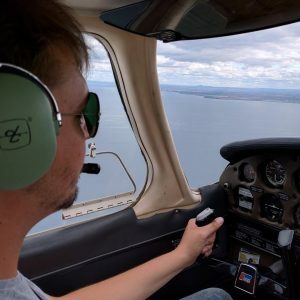 The catchment area wasn’t particularly huge as the local airport had limited connection (which grew over time) and for many people, travelling to Hartford, Connecticut wasn’t at the top of the bucket list – which put people off investing the time and money to travel that way. Now that the event was established, it was time for FlightSimCon to move to a bigger venue and a bigger city. Reading the 2013 FlightSimCon planning document, it’s clear that there was always an intention to move the conference to ‘other metropolitan’ regions providing the event was successful. This was further backed up by both Chuck and Nicole in email exchanges I had with them – they were both passionate about moving it from Hartford. As a result, they chose Dallas, Texas for FlightSimCon 2018. Speaking to the FlightSimExpo team, they felt as though there was “there was no impression from Nicole that the location would be changed in 2018.” This was much to their surprise, as the feedback from the 2017 conference was clear; it needed to move out from Hartford in 2018 to entice exhibitors to yet again attend the show. 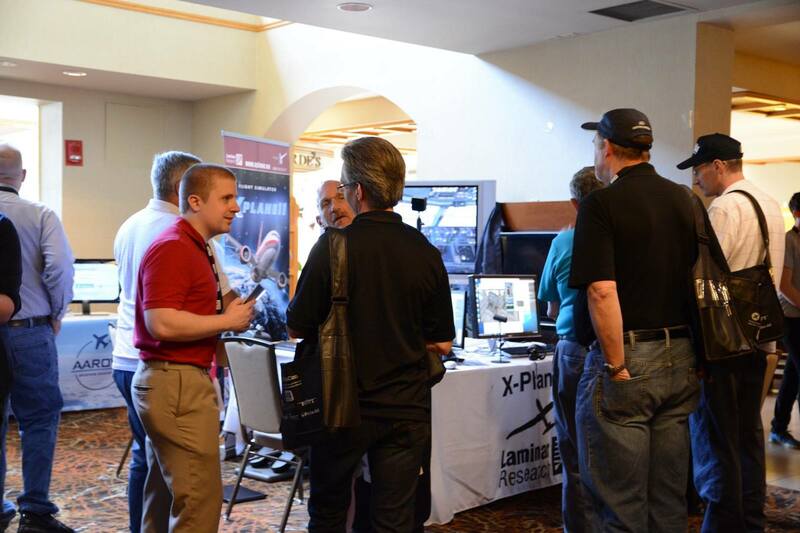 This conversation between the FlightSimExpo team and Glander Associates Events took place not long after the event finished. Further conversations also held the same merit. Other developers who passed on their feedback, including Stefan (PILOT’S) made the same reference in that it was unlikely to move. This point is further backed-up by D’Andre (AirDailyX). He had discussed the possibility of moving it out of Hartford with Glander Associates Events – and subsequently searched for new venues. From a cost perspective, Hartford was an easy choice. We are privy to information that highly suggests that Sheraton Hotel would continue to be the venue of choice going forward as it substantially reduced the cost of the event. It is my belief that this same private information was also acknowledged by the FlightSimExpo team, which is why they were led under the impression the event would not be moving away any time soon. In spite of all this, communication sent out by Glander Associates Events following on from FlightSimCon did show that the team were evaluating the possibility of moving the show on the road. This follows up with what their 2013 proposal stated. Furthermore, Chuck said “new locations were being considered. This included the Intrepid Museum in New York, going to Los Angeles, Denver and others”. As we can now see, the event has moved to a more central location. The reasoning behind the move to Dallas, Texas is due to the easy connections from all over the states, great evening entertainment and the amount of aviation history that encompasses the city itself. As to whether this information was privy to other developers sooner than the official announcement is not clear to me. Nor do I know if previous exhibitors were contacted prior to confirming the location to check on suitability for them. It is my reasonable belief, and personal opinion, based on the evidence above, that there was certainly a lot of consideration to move the event, even though there were some strong reasons to stay in the area. However, I get the impression that Glander Associates Events felt that Las Vegas would not be a suitable location for FlightSimCon 2018. With two events, in two locations on two different weekends in June – the flight sim show world just became a lot more segregated. The question is, was there any discussion on trying to keep this as one event to prevent this? From what I can tell, the simple answer is: yes. The FlightSimExpo co-founders have had email communications with Glander Associates Events regarding the future of the show. The FlightSimExpo Team felt that feedback and input about Las Vegas and many other elements was not being listened to, and would not be listened to. Accordingly, the team behind FlightSimExpo recognised they may have to take action to protect the event. With their real-world experience and the knowledge of the community, the team emailed Glander Associates Events. 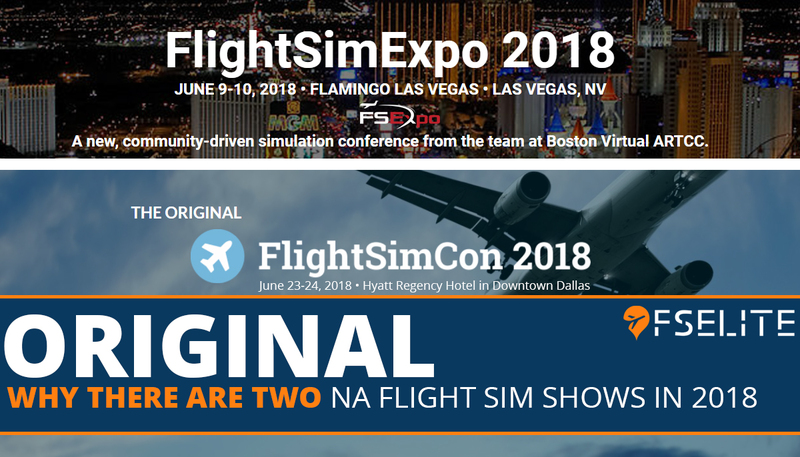 The FlightSimExpo team said, “Nicole, at this point, the best way you can help grow the future of FlightSimCon is to transition the responsibility of running the event to [us]”. From the evidence provided to me, there was mutual discussion on purchase rights. It should be noted that FlightSimCon was never up for sale. Whilst the current FlightSimExpo team put in significant amounts of time and effort into the show, the property rights remained those of Glander Associates Events. As stated above, current members of the FlightSimExpo team were under a contract during the 2017 event. The contracts made it very clear that their role was supportive and was in no way giving any ownership rights to them. However, some of the emails I’ve read that were exchanged between the two parties suggest that members of the FlightSimExpo team believed they owned some of the content they were contracted or volunteered to do. As discussed, this work was done on a commission basis to help with the success of the event. Moving forward with more discussions on how to proceed, Chuck became a mediator between Nicole and the FlightSimExpo team. It was at this point that Chuck said to the team that they should make an offer to have the rights to the show and other Glander Associates Events property. An offer was made, but was subsequently rejected by Glander Associates Events. Chuck told us that the reason it was rejected was because “as anyone who watches Shark Tank knows, businesses are valued at 2-4 times the cash flow and their offer was nowhere close”. It should be noted that throughout correspondence, there was a lot of effort to try and retain a level of solidarity throughout. It was acknowledged by both parties that having a single event would be in the interest in the community for both attendees and exhibitors. As an agreement couldn’t be reached, as of September 5th 2017, the FlightSimExpo team was no longer involved in FlightSimCon, and contracts were immediately terminated, as Glander Associates Events insist there’s evidence of misdirection. However, none of this evidence was supplied to FSElite during our lengthy investigation. With this termination in relationship, this was when the divide happened and preparations began on both sides to continue without one another. At this point, I believe there was no further communication between the two parties. Based on conversations I have had with, June was originally selected by FlightSimCon as it clashed the least with other calendar events and was commonly agreed to be the best time of year for people to travel. With this knowledge in mind, it’s no surprise that both FlightSimCon and FlightSimExpo would take place in June. It is my reasonable belief, and personal opinion, based on the evidence above, that both FlightSimCon and FlightSimExpo team members were fully supportive of ensuring a single event. This is backed up by developers and event goers. Continuing with a single show was certainly in the interest for all parties involved, but an agreement on terms could not be met. It should come as no surprise that FlightSimCon 2017 was successful. With record numbers of attendance, exhibitors and a wealth of guest speakers, it as clear that the future of flight simulation shows in North America was strong. Based on my discussions with Chuck, the first few years of FlightSimCon were met with losses, but the community had a massive benefit from being at these shows, which is why they continued to pursue the event. With help from community members from the current FlightSimExpo team, the support of D’Andre, and media partners such as ourselves, it was soon a huge event with lots of interest from the development community. Obviously with so much attention now on the event, it meant more people were coming and more people were prepared to pay for entry. Between them, the FlightSimExpo team have years of event planning experience. The team has worked closely together for the past 10 years and members of the team are professional event organizers. Money is always a big motivator for many, but putting on a show like this certainly isn’t cheap, nor is it easy. I spoke to the FlightSimExpo team who made it clear that this wasn’t the reason for wanting to put on a different event. The motivation for wanting the control of the event is to allow the show to continue growing and to become more accessible. We did talk a little bit about money, and simply put, it’s unlikely FlightSimExpo will make any form of profit this year. With many developers and publishers already committing to the show, it’s likely that the money will be wisely invested back in. There will still be a lot of cost associated with the event, and the FlightSimExpo told me they’re controlling the costs wherever possible. They were honest and said “if there is a profit, there’s a profit – but that’s not why we’re doing this”. It is my reasonable belief, and personal opinion, based on the evidence above, that FlightSimCon has yielded a profit from past events. I also believe that members of the FlightSimExpo team have gained an insight into the financials of running a show of a similar size. With this in mind, I do not believe splitting away from Glander Associates Events was purely done for financial gain. The origins of this article came from seeking clarity as to why there are two flight sim shows in North America in 2018. Some of the queries above were the direct result of being asked to investigate them by the FlightSimCon team. I hope that throughout this article, I have provided clarity on their queries, demonstrated my opinions and delivered on providing a balanced view. It is clear that the market for North American flight simulation events is growing massively, which means that competition was inevitable at some point. Both sides will have their version of events on what happened, but based on what I’ve heard, read and seen, this seems to be a case of two groups of people having different visions for the future of flight simulation conferences. It does have an impact on the rest of us, as many developers and attendees will have to chose which event to attend and invest in. For many, it will boil down to who’s going to what shows, and for others it will come down to dates and time. As a flight simmer, it’s exciting that there is a choice. It’s also exciting that more people than ever have the opportunity to attend a great weekend event and hang out with people who as passionate as they are. At the same time, it’s a new challenge for media partners and exhibitors who use these events to share with the community. Saying that, with great challenges can come great rewards. With this now out in the open, it’s our intention to move on from this and focus on promoting both shows throughout 2018. 2018 will certainly be a year to celebrate for flight simmers and whatever the outcome for these shows in the future, we wish them all the best.